Ladykiller by Lawrence Light and Meredith Anthony, a Mysterious Review. 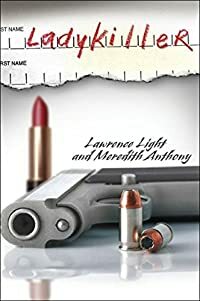 Review: The papers have coined the term Ladykiller to describe a serial killer who has already struck three times, and kills a fourth woman in the opening chapter of Ladykiller, a new book by the married writing team of Lawrence Light and Meredith Anthony. The couple have created a compelling character in NYPD detective Dave Dillon and crafted an interesting, if somewhat flawed, series of crimes for him to solve. The four murdered women apparently have nothing in common, living in different areas of the city and having different socioeconomic backgrounds. But all were killed in the same way: a 45-calibre bullet through the right eye at close range. Detective Dave Dillon of the NYPD is assigned the case, and is aggressive in pursuing leads. Just when he thinks his investigation is making progress, there's a twist: a man is killed in the same manner. Was it wrong to assume the killer was simply stalking women? Could this latest murder be a copycat crime? Or is there a common thread linking these crimes that has nothing to do with gender? There are a couple of plot points that tend to weaken the overall story. The crimes are set in 1991 where the NYPD seemingly have limited forensic skills (at least compared with what ostensibly is the norm today). This leaves the authors with the freedom to have the killer walk away from the crime scene leaving minimal evidence to be found by the authorities. Murders of this nature would seem to leave an abundance of clues and setting the book in the present day would require a killer that was far more careful. Furthermore, it seems highly improbable that one would calmly stare at their killer, someone who was pointing a gun just a few inches from their right eye, even if they knew them. Maybe once or twice, but some 6 or 7 people are ultimately killed in this way in Ladykiller. It's simply not credible. The authors reveal the identity of the Ladykiller early in the book which removes a huge element of suspense from the story. Typically in a book with a known killer, the plot becomes a police procedural. But not in this case: there is nothing terribly methodical about the way Dillon handles his investigation. Thus to keep the reader's interest, what follows is a series of unexpected twists and turns that are hit-and-miss; some work within the context of the plot, some don't. Fortunately, the ending works, and provides an element of surprise that will have the reader thumbing back through the pages to see how they missed anticipating this startling conclusion. Acknowledgment: Maryglenn McCombs Book Publicity provided an ARC of Ladykiller for this review.